In recent kitchen trends white seems to be the colour of choice, with white kitchen cabinet doors, white benchtops and white walls. But if you are a person who likes to add a splash of colour but you’re not courageous enough to do something like this……..
……then here are some ideas for incorporating a modern new kitchen design with a splash of colour without being overwhelmed by your choice. The obvious choice is to select coloured kitchen cabinets or a coloured benchtop, it doesn’t have to be a vibrant colour, but more in tone with the surrounding colour palette of your home. As you can see in this picture, our client selected a polyurethane paint colour to match their existing wall colour, to ensure a nice contrast between the two, they have selected a darker shade of the wall colour. But if you want something a little more subtle, especially if the colour you want to use is quite vibrant, then another idea would be to have a coloured splashback, this way you could have more neutral tones for kitchen doors and benches and accentuate smaller areas without the colour being overpowering. In this picture, our client has chosen white kitchen cabinet doors with a light colour stone benchtop and added a dash of colour in the splashback giving this new kitchen some personality. 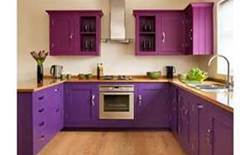 If you are still unsure and worried that you’ll tire of the chosen colour, you could always play it safe and stay with modern kitchen colours for your kitchen cabinet doors, kitchen benches and kitchen splashback, and instead paint your walls with the desired colour. By doing this, you will have the versatility of changing the colour whenever you get bored. Don’t forget, many kitchen gadgets and appliances are available these days in co-ordinating colours making it even easier to match them to your kitchen palette, to add a splash of colour or to spruce up a boring space to make it a stand out feature in your home. Don’t forget, if you want a free design and quote on a new kitchen, a kitchen renovation or a kitchen makeover, please contact us on 1300 027 337 or complete the contact us form on our website and we can arrange your in-home obligation free design and quote at a convenient time for you.